This entry was posted on March 5, 2010 at 9:08 pm	and is filed under ENGLISH, Horary. 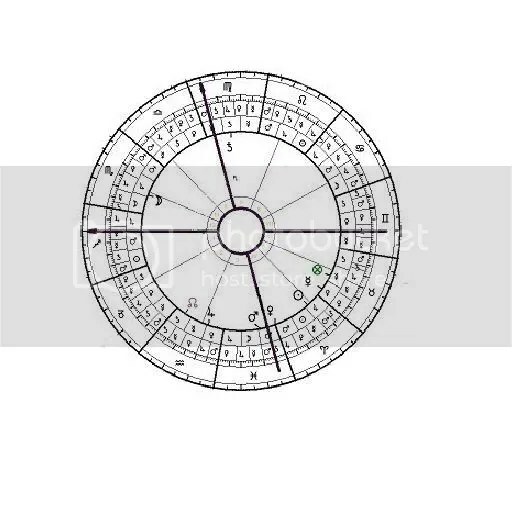 Tagged: 5th house, astrology, chart, Horary, horoscope, Jupiter, mercury, moon, prediction. You can follow any responses to this entry through the RSS 2.0 feed. You can leave a response, or trackback from your own site. are you using the reversed PoF in nocturnal charts on principle? Although it is hard to determine without accurate data for this chart, it seems that if the PoF would not have been reversed, it would have been placed in Cancer, an apt decsription for the wet place, etc…. you are right, I reversed the formula (an option in the software) in this particular horary so to match the original chart I had made the astrodienst (where it initially gave the POF in taurus). Astro gives it as default in taurus when we use the “different day/night formula” option and was the original delineation on their program and I thought it might was a bug in Morinus. Good catch! Is good the reversion did not mislead drastically. What software produces that chartwheel with the terms and faces built in? Very cool. Dear Christine thank you for the comment! I found it a nice practical example for using traditional attributes like temperature and element qualities (I rarely see those in use – especially the temperature ones). I used Morinus software (which looks much better in reality than the dreadful jpgs I make of it).